A flamboyant, fragrant feast of flowers for your garden! Fantastic plant to grow against a sunny wall. The flowers of this new variety are a delightful creamy yellow and have the same intense fragrance. The beautiful contrasing green foliage lasts throughout the year, turning to an attractive bronze in the colder months. The whole plant is hardy down to -10°C and can easily be controlled with light pruning. Delivered as an established plant 90cm tall on tripod in a 3L pot ready to plant out straight away. This recently introduced evergreen climber is a fantastic plant to grow against a sunny wall. Instead of the usual white, the flowers of this new variety are a delightful creamy yellow and have the same intense fragrance. The beautiful contrasing green foliage lasts throughout the year, turning to an attractive bronze in the colder months and the whole plant is hardy down to -10°C, so is perfect for UK gardens. For best results and to appreciate the lovely scent, grow in the warmest part of the garden. This is the perfect plant for a large pot too grown on a tripod or obelisk. Supplied as an established clilmbing plant in a 3L pot, ready for immediate planting. Delivered as an established plant in a 3L pot ready to plant out straight away. Will give a good display in the first year. Lovely in a large pot with an obelisk to support. Plant Trachelospermum in fertile, well-drained soil in sun or semi-shade. Choose a sheltered position that is protected from cold winter winds. Can be grown in a conservatory or greenhouse in a pot with shade from hot sun. If growing in pots, choose one which is at least 45cm (18in) in depth and diameter and use a soil-based compost such as JI No.3. Place some bricks in the bottom of the container to provide ballast. In particularly cold areas, Trachelospermum is best grown in containers that can be moved to a protected position over winter. Provide the twining stems with an appropriate frame support such as trellis, an obelisk or wires. Tie in the young growth then once it becomes established it will attach itself to the support naturally. Always keep well-watered, pay particular attention if growing in a container as plants can dry out quickly. Top dress with some balanced fertiliser in spring, water it in then add about 5cm (2in) of good quality compost. Tie in any stray branches back to their supports to improve the shape of the plant. 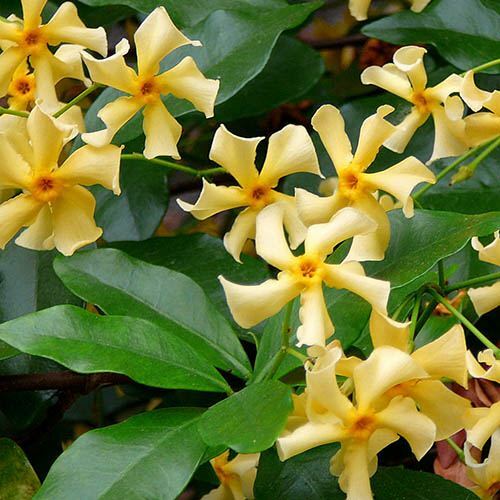 Trachelospermum doesn’t need regimented pruning - just cut any stems back after flowering if it gets too big for its support and in general remove any stems that are damaged or dead. Edible Indoor Pineapple Plant - Ananas comosus.